I've decided it's time to cut my hair, cause I haven't done this in months and I need to, due to split ends. I'm actually trying to grow my hair longer, but you should know, as a tip, that even if you're trying to grow out your hair, you still need a little trim from time to time. Cause split ends tend to get worse and, if you don't cut them, you'll get a much more damaged hair over time. So I thought I'd share this with you guys and show you how to cut your own hair and save a lot of money, time and nerves, cause getting a hair cut at a salon is always stressful and you never know what you end up with...I've had a lot of bad experiences with that. I've been cutting my own hair for about a year now and I thought I'd show you how to do it. scissors, but don't use paper ones. It's not that expensive to buy some that are specially made for cutting hair. You can find some HERE. a round brush, which is only necessary if you want to style your side swept bangs and to get more volume. A few tips before you get started: You need to have smooth hair, so that you can see clearly what you're cutting. So make sure you comb your hair well. Also, NEVER cut your hair when it's wet, cause it looks longer when it's wet and after you dry it, you may realize that you've cut more than you've wanted.. and there's no way to stick it back. And if this is the first time cutting your hair, don't make a radical change. Try cutting a little bit at first, just to get used to doing this. Now, when cutting, hold your scissors in a downwards direction, so that you get nice layers and you don't have to trim your hair this way. And before doing any cut, comb again each layer. 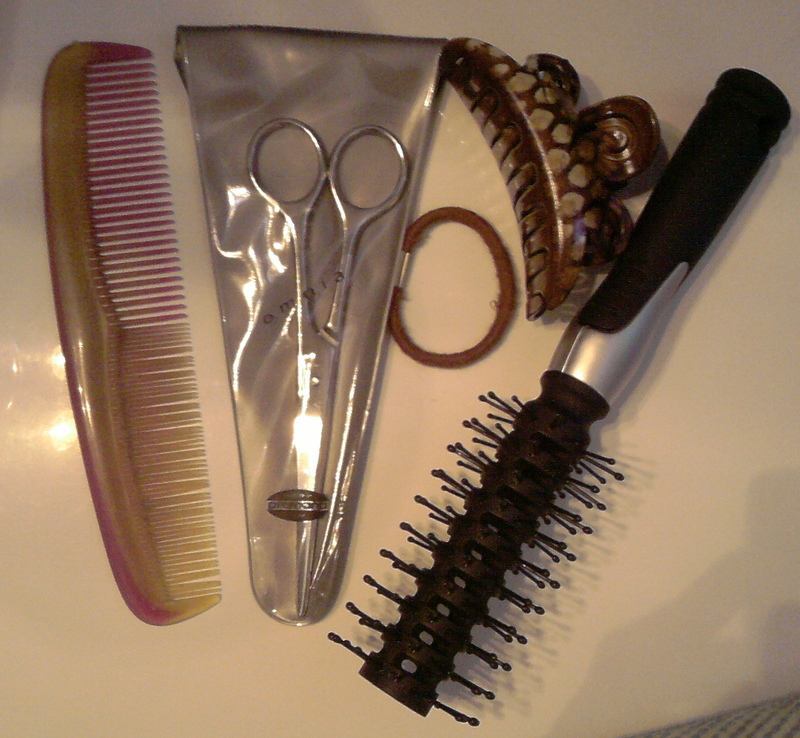 Keep the comb at the end of your hair and cut right above it, also keeping the scissors in downwards direction. You can also cut the ends keeping the scissors upwards, in order to get more texture. But never cut in a straight across line, if you want to get nice layers. Then tie your layer with the elastic hair band, release another layer, clip the rest up and repeat. So now I'll show you how my first three layers look like. The fourth one is the shortest one and it goes to.about the corner of my mouth. 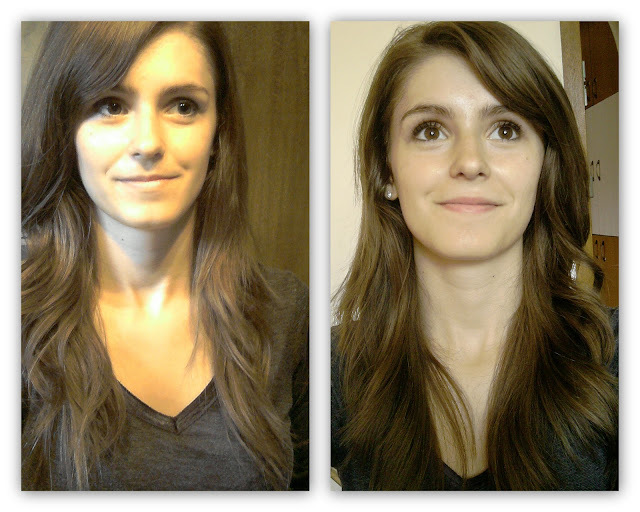 If you cut your hair this way, in many layers, you'll get more volume in your hair and it will be easier to style. For cutting the side swept bangs, you should choose the hair you want to cut and bring it up front like you'll see in the picture. Now, you're gonna pull the hair together between two fingers and cut it in an upwards direction, in order to get more texture. Don't cut in a straight line! My bangs go a little above my nose and it looks straight across when it's all in front, but when you swoop it to the side, you'll have really nice side swept bangs. 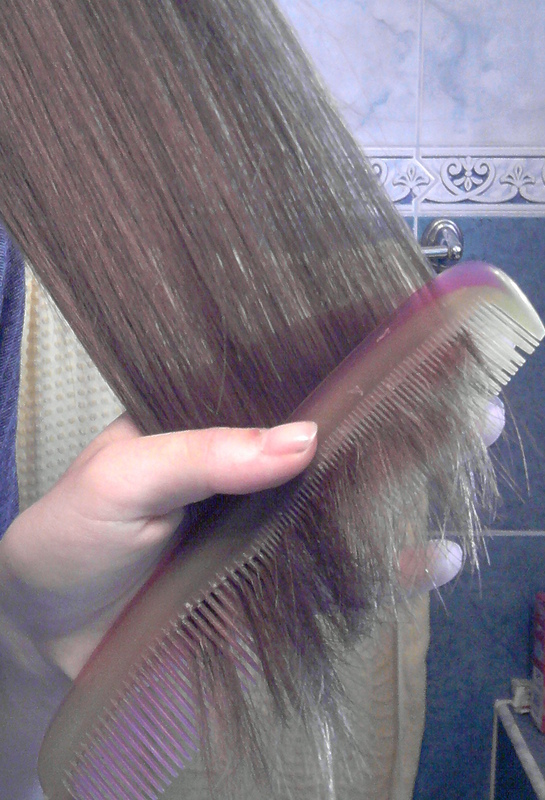 As for styling my bangs, I usually blow dry them in the direction I want, using the round brush in the picture above. 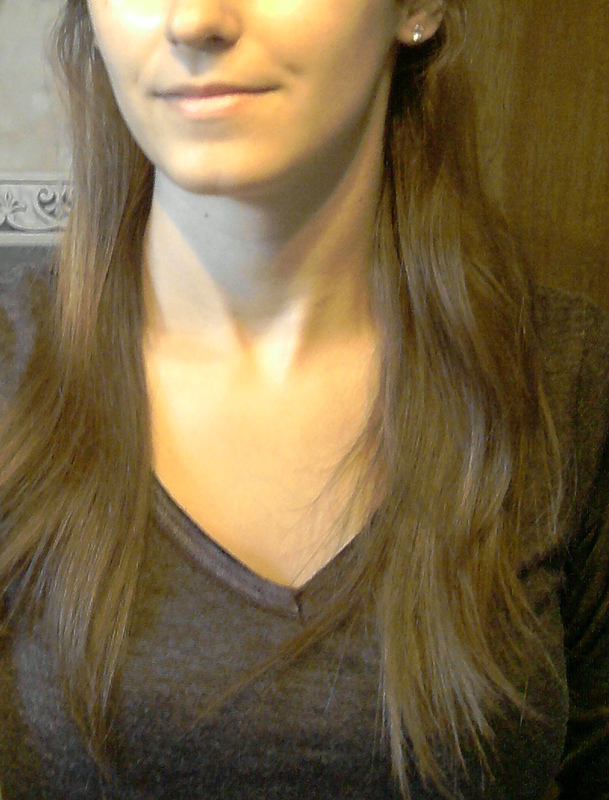 Then I straighten them a little bit and maybe add some hair spray, to keep them in place all day. And here's a before & after picture. You're not gonna see a major difference, because I didn't do anything radical. I wanted to keep the length, but get rid of split ends. If you want a shorter hair cut, you just need to cut a little bit more from each layer. How do you cut? It is easy to do left side but right side is very difficult for right handers! @Anonymous: I don't really find it difficult on the left side either. I'm not sure how to explain, but I just do the same thing. I bring the hair in front with the comb, so I can cut it. @Anonymous: I would suggest trying to start your bangs further on top of your head, so that you get more hair in the bangs - if that makes any sense. As for layers, try cutting the hair in small snippets, not one big one - so really small strokes that will give a more layered effect, rather than blunt cuts.